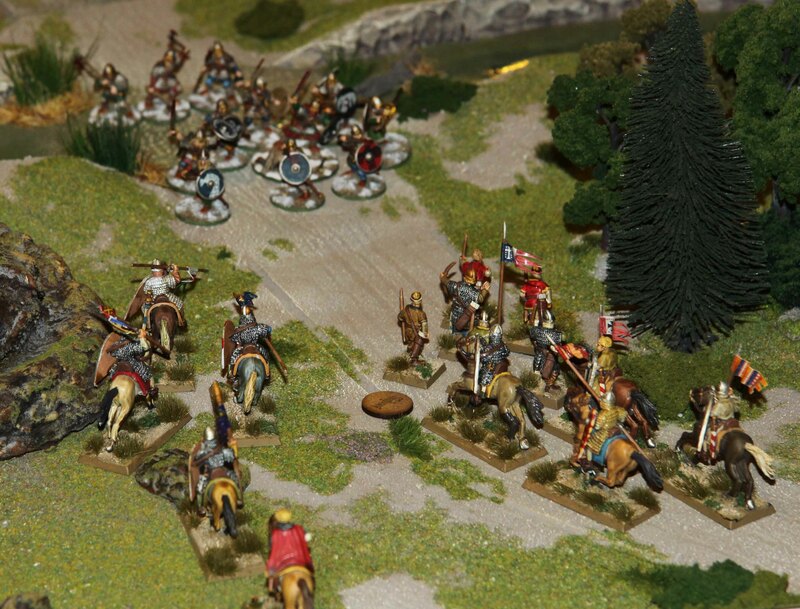 So after a day of catching up, here is a short recap of the German SAGA Grand Melee that took place this weekend. And I could not have hoped for better companions on this tournament. Each and every single game was great fun and I could not have hoped for better people to play against with! Thank you all!!! 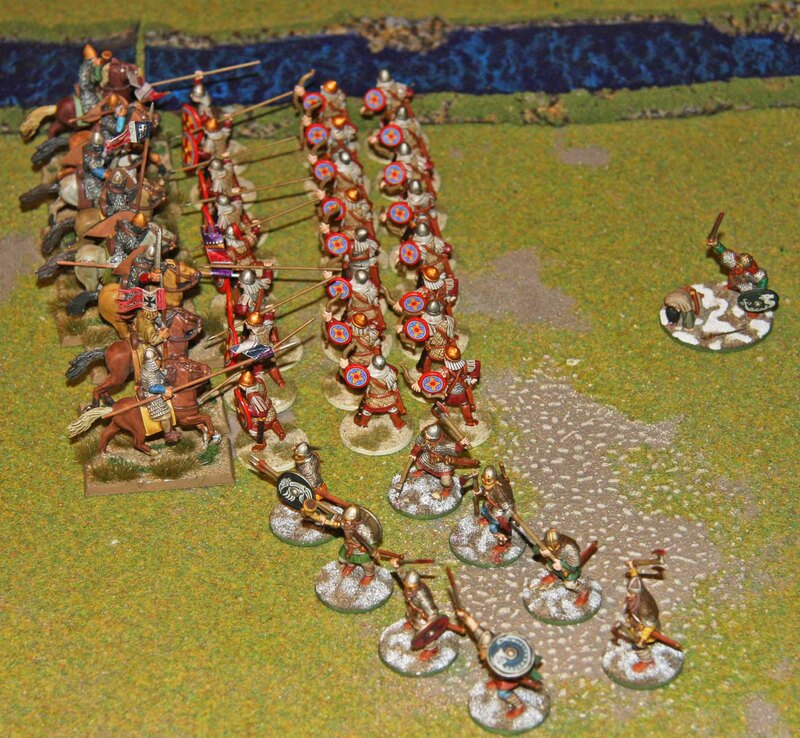 My opponent used a Warband led by Raymond du Puy, which featured 12 mounted Heathguards (split into two units of 6), 12 Warriors with crossbows and 4 mounted Warriors. Right up at the beginning of the game I had to pay dearly for my ignorance. I knew that there was an Errata / FAQ for SAGA. I could not find it online on Thursday night and thought “how much can be in there that is not just cosmetic?”. Well turned out, a lot and I had to learn it all the hard way. 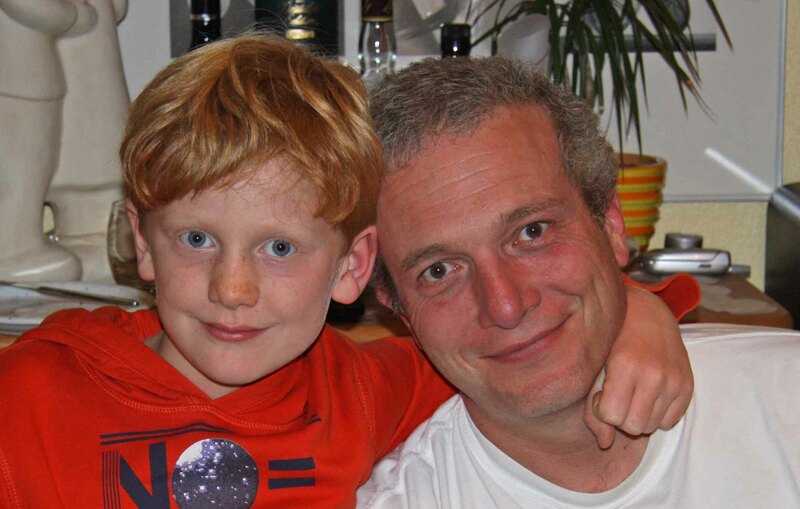 But all that being said… it all started going badly from the start. I lost the initiative roll and before I could do anything, this crossbows shot 6 of my Heathguards out of their saddles. The rest of the game did not go much better. My opponent managed to push his Piety high from the start and this meant he could always draw a lot of extra dice from his combat pool. Combined with a SAGA ability that allowed him to turn his own Fatigue into attack dice, this turned into a meat grinder. Neither of us managed to kill the enemy Warlord so the close combat kills decided the winner. I almost managed to get to a draw none the less, but to be honest… my opponent never even used one of his Heathguard units and the mounted Warriors (they protected his Warlord the whole game), while I had to go on an all out offensive in the end. So in the end it was quite a clear loss for me. Not a good start to the Grand Melee. 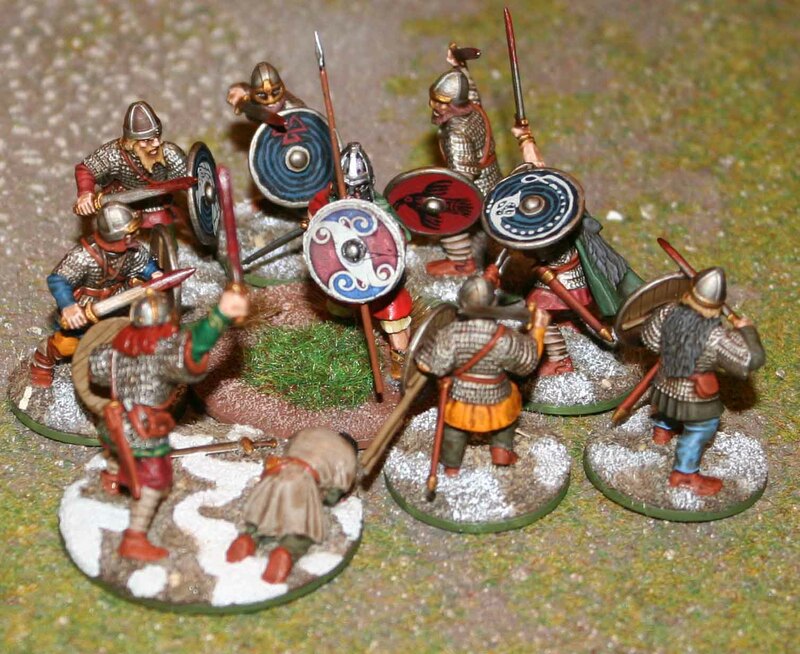 I had learned to hate the Milites Christi in my first game and was quite sad to draw them again for the second game. So what did my new opponent field this time? 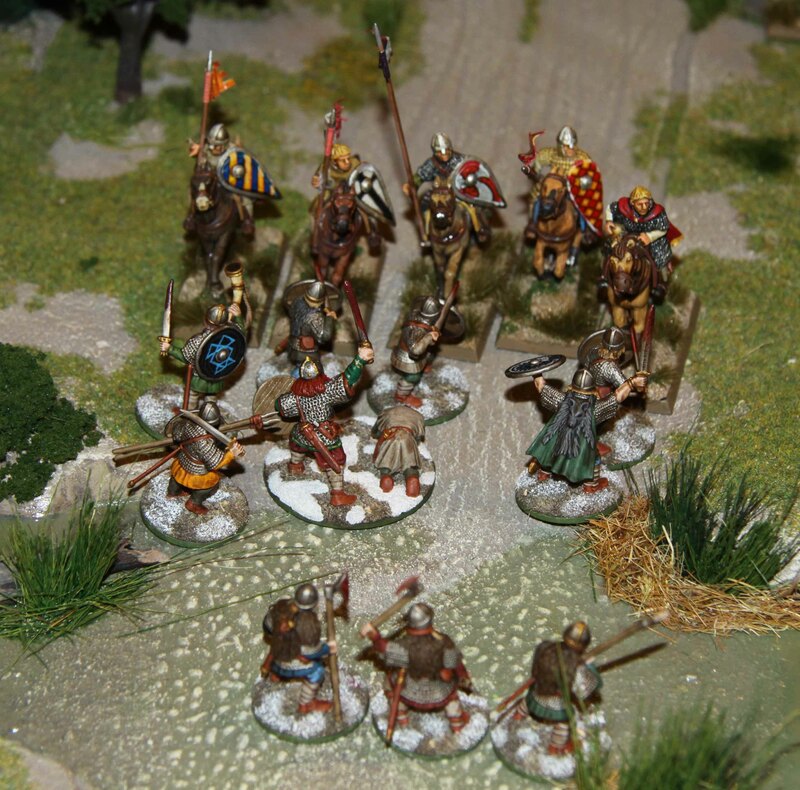 The Warband was led by a normal mounted Warlord and featured 3 units of 4 mounted Heathguards each, 12 Warriors on foot with close combat weapons and 12 warriors on foot with crossbows. From the very start I had a bad feeling. 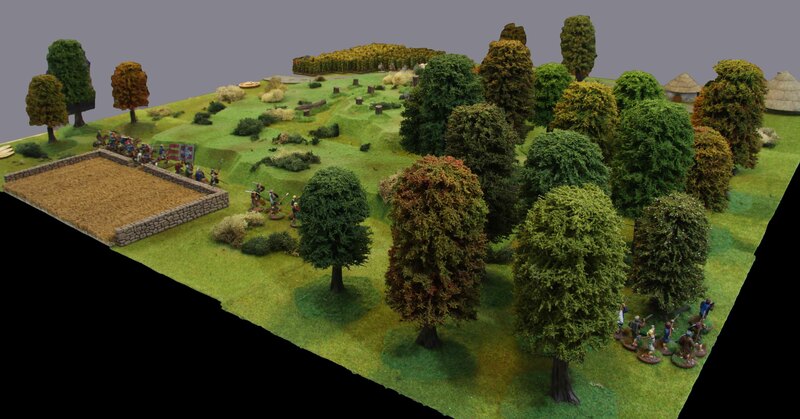 He deployed all his Warriors infront of one of the target woods and his Warlord and Heathguards spread over the middle and on the other flank. I felt my archers would be useless in the woods so I deployed them in the centre with only my spearmen to oppose the enemy Warriors. 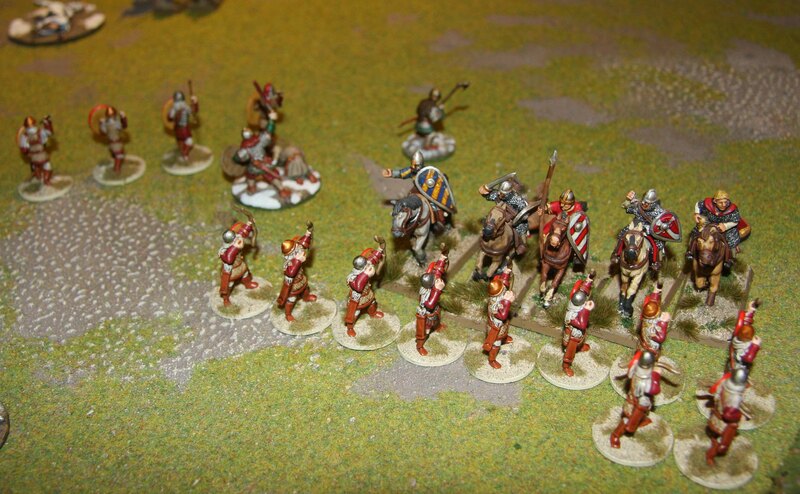 My mounted archers were deployed on the right flank and the other Heathguards centre. 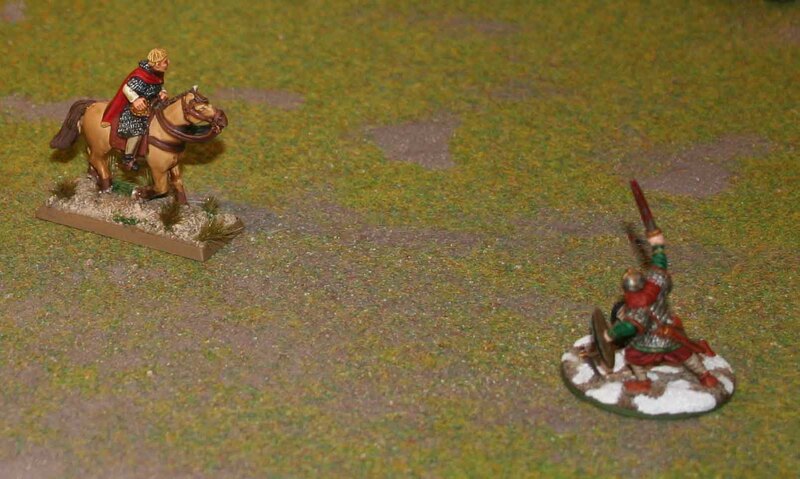 Since my opponent had the initiative, I had expected him to take the hills fast with his cavalry, where I would have had real problems dislodging them, but this did not happen (for fear of my archers, as he told me later) and he only advanced this crossbows into the woods. 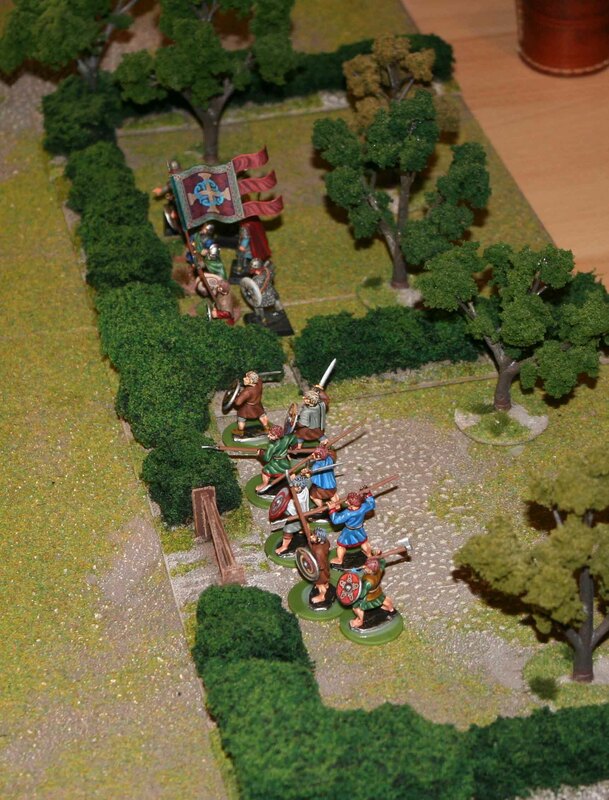 My spearmen marched into the same woods and even got into close combat with his crossbows. Now over the next few rounds I rolled exceptionally good on all combat inside the woods and both his Warrior units were unable to dislodge them and were only able to reduce them to 3 men (units of 3 men or less were unable to score victory points for holding an objective) on the 4th round. 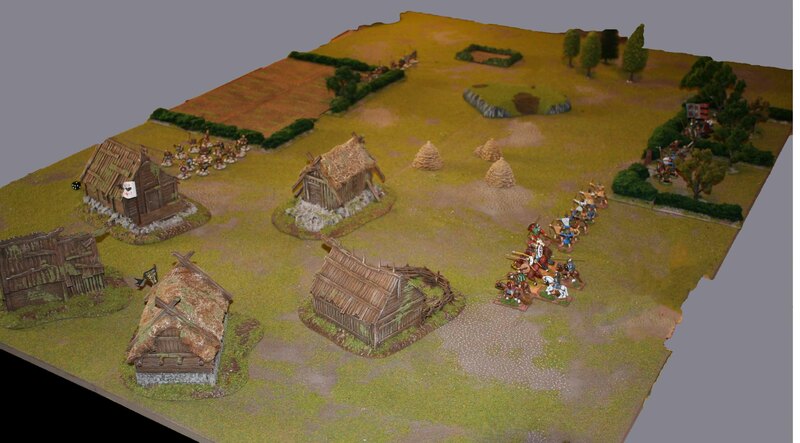 On the other flank I had all my cavalry and archers on the two hills by the second round. Now he had real problems dislodging my troops. Even when he won a close combat, I was unable to withdraw due to my troops being deployed in lines behind the other and so he had to withdraw. At the same time I was quick to reduce his Heathguard units to 3 or less men. At the end of the 4th round, only my archer units were large enough to still score victory points, but the same was true for his heavily depleted Warriors. Since I was already about 30 victory points in the lead and he only had a chance to gain a maximum of 5 points a round (and only if he was able to reduce my archers further and I did not kill any more of his Warriors), we called the game off with a decisive victory for me. 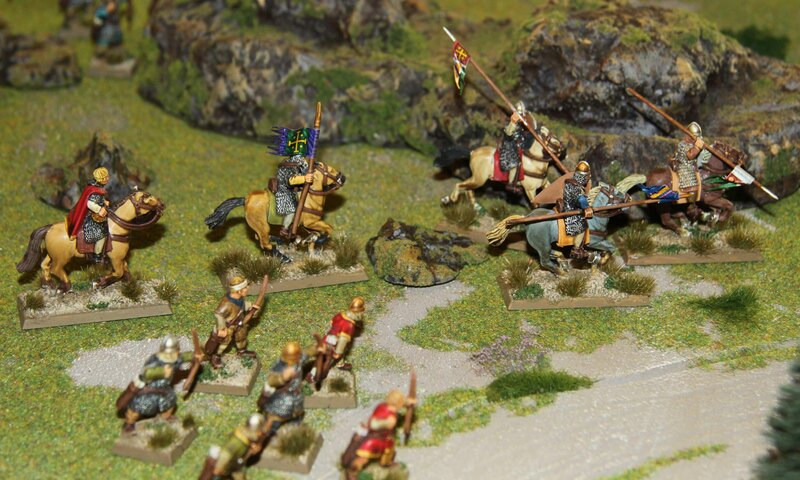 For the third game a finally got to play against a Dark Age army… namely the Normans. 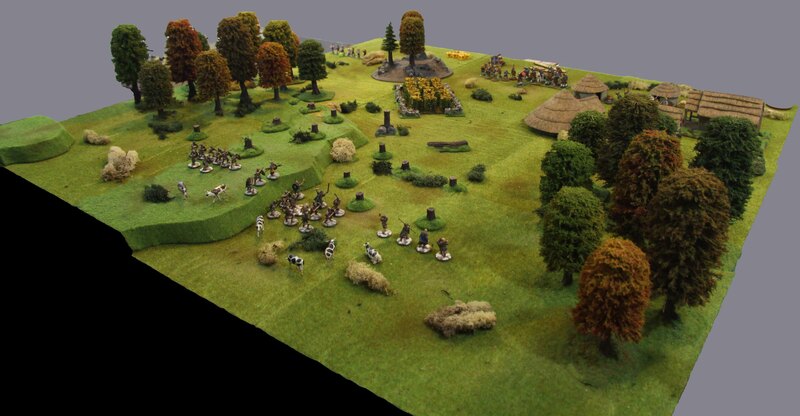 They were led by a mounted Warlord and consisted of 4 mounted Heathguards, 8 Warriors with Crossbows, 8 Warriors on foot, two units of 8 Warriors on horseback and 12 peasants with bows. 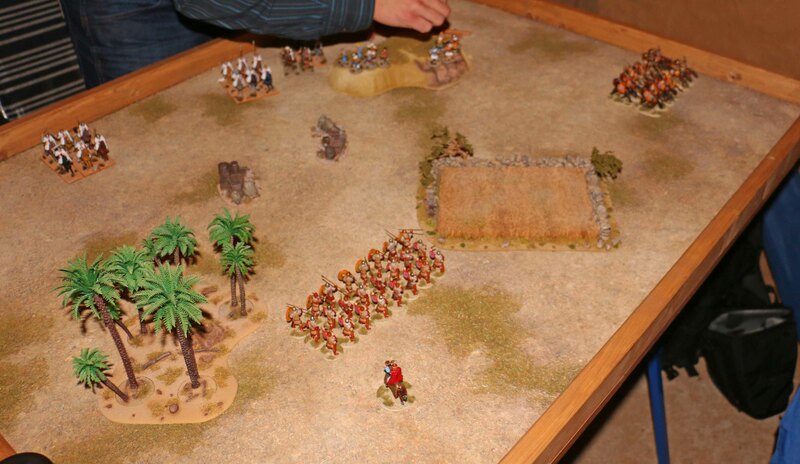 I had deployed my huge block of Warriors right on the border between two table quarters, which meant I could choose which of the two quarters they were supposed to score for. 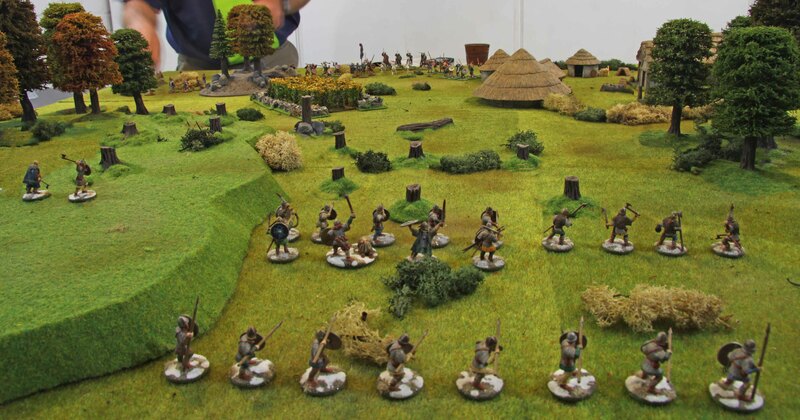 This proved great throughout the game, since they could remain quite stationary, score the victory points where needed most and shoot it out with the enemy archers and crossbows. All in all my opponent and I were on an even footing and for the first 3 rounds we both scored 2 points each (giving each of us 6 points in total). Only then did the scales tip, when I managed to kill his Warlord and reduce his Heathguards below 3 men while my Heathguards managed to stay virtually intact almost for the whole game. So in the end I won with 12 victory points vs. 8. Something that I need to mention about this game is how much fun it was. As I said before, every opponent I played was great, but I honestly think, I never had so much fun and laughed so much during a game. So I ended the first day on the 9th place. The Norse Gail were a bit of a wild card for. I had never played them and from a quick look at their battle board, I had no idea how most of their abilities worked. 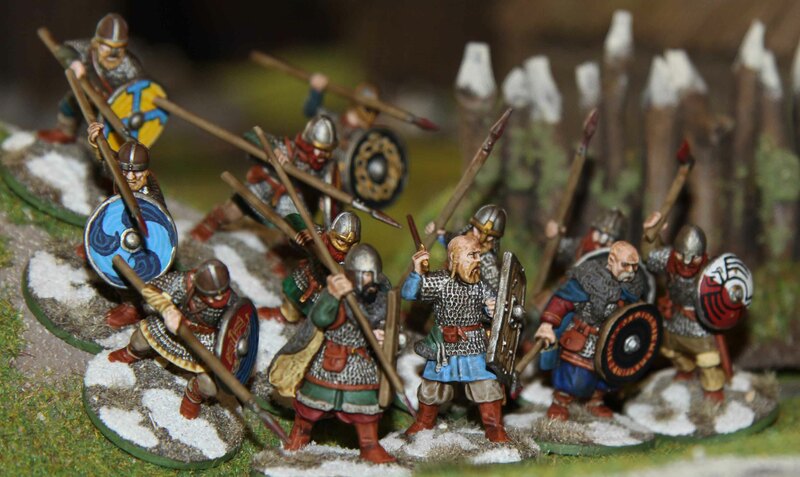 The Warband consisted of one Warlord with a Dane Axe, 40 Warriors with Dane Axes (which would be spread over 8 units of 5) and 12 Levies with Javelins (which would be spread over 3 units of 4). In this scenario, we each had to say, how many rounds it would take us to annihilate the enemy. The player who bid lower would be the attacker and would have to annihilate his enemy during that time, while the other was the defender and had to survive. I had a feeling that even with my cavalry I would not be able to evade so many troops forever, so I did not want my opponent to be the attacker with a high turn count. At the same time I felt that if I really pushed hard, I should be able to kill all his troops in 7 rounds. Especially since he would also lose the game, if his force no longer created SAGA dice, so I could ignore his Levies. So my bid was 7 rounds, his was 8 and I ended being the attacker. And it proofed a hard nut to crack. About half his Warriors deployed within the woods where I would have a hard time dislodging them with my cavalry or archers. 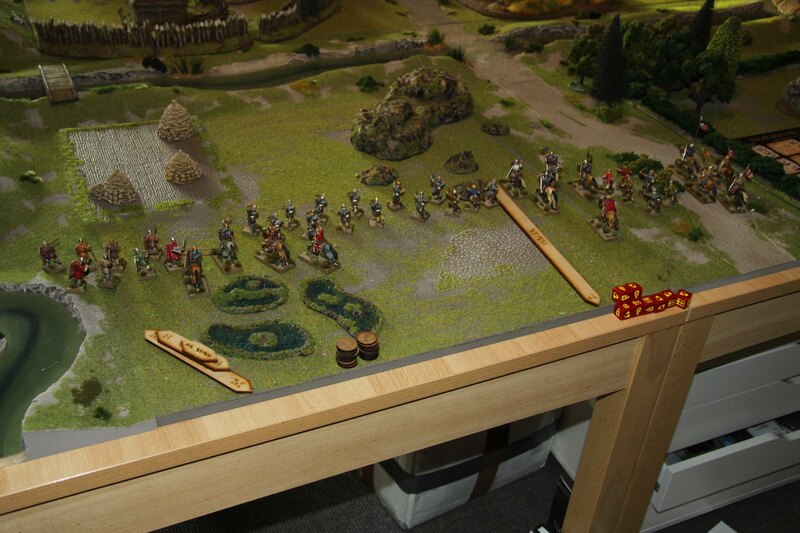 And I had to find out, that his battle board could actually deny me entering combat with his troops. Things were only made worse by the fact, that my opponent would always put as many dice on the defense as possible and that he would not use my fatigue to boost his stats or lower mine, but rather let them accumulate to get my troops exhausted. My first solution was to try to kill the Warlord as fast as possible and take out those Warriors in the open to reduce his SAGA dice, thereby denying him the better abilities on his board. This was easier said than done, since three of his units were reduced to 1 man by the end of the 3rd or 4th turn, but that one man always proofed hard to kill. In the end it was all or nothing, with the Heathguard archers attacking in close combat, my cavalry continuously charging into the woods and the Warlord attacking on his own. In the end it was a very tight race, with my mounted archers killing the last enemy Warrior on the penultimate activation of the 7th round, nailing me the victory. 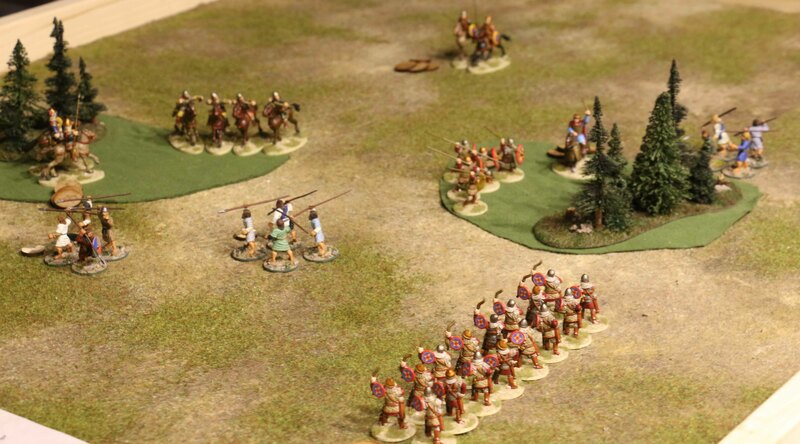 Not that I would have had another chance… by this time all my mounted units (including the Warlord) were inside the woods and had 4-5 Fatigue counters, the Warriors were exhausted, too and my archers close to exhaustion. If I ever played one intense game, this was! And if there ever was a battle worth a song in my Warlords Saga, this was it. For this last game, I faced one of the organisers, who stood in with his Irish since there was an odd number of players. That being said… the stand in player already had quite a track record with three wins and one loss and he did not give me an easy game either. Which was great, since nothing is worse than a victory one did not earn! The Warband consisted of a Warlord on foot, two heroes on foot, 6 Heathguards on foot, two 12 men units of Warriors and 8 Warhounds. In the end we were half a kill point apart, which meant a draw. So in the end, I won 3 victories (one of them decisive), had one draw and lost one game. This gave me a shared 5th place out of a field of 27 players. And I have to say, I was really happy with this. As I said before, I felt the Byzantines were not my first choice for this tournament, but the only mounted one I had painted. And the use of the SAGA abilities vindicated that. While I used the Massed Archery ability quite often, there were few situations where the others were of use. I used Kontos three or four times, but otherwise it was Support Archers (2x) and Strategikon (1x) and Withdrawal (1x) during the whole tournament. So not much mileage was gained from the battle board. Another factor was that I had only played two games of SAGa in 2 ½ years (and both over the last month) and did not know the rules changes from the Errata / FAQ. 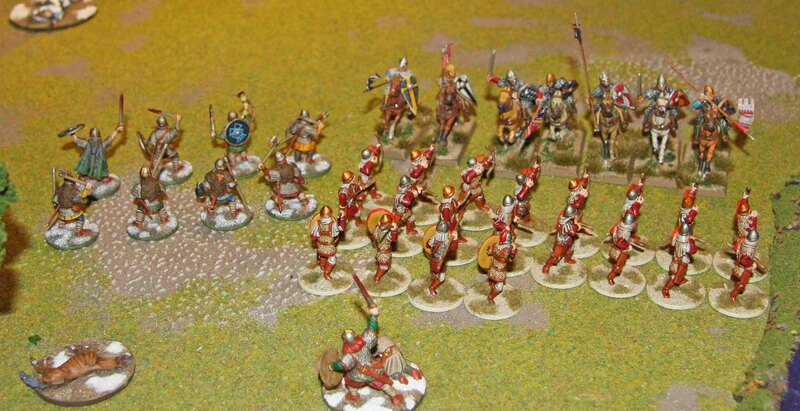 Combined with the fact that out of all the Warbands I faced I had only ever played Normans it felt like an uphill struggle virtually all the time. So again, I was more than happy with the result!!! 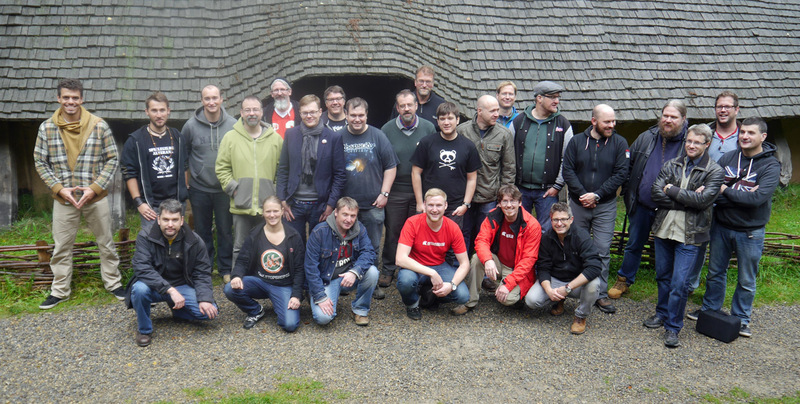 First of all, I cannot mention often enough, what a great event this has been and I am really looking forward to the next installment, hopefully at the same great location! 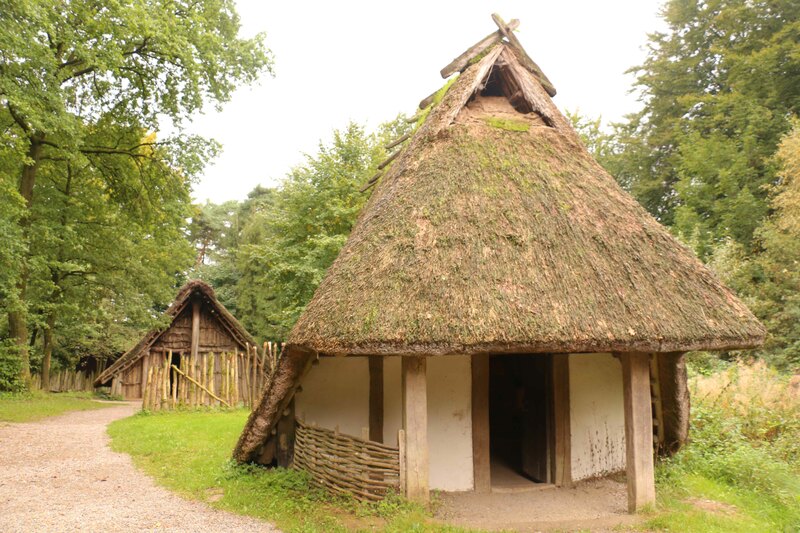 Anyway, I am going to leave you with some photos of the other armies in the tournament (at least those photos the came out OK in the light without a trip-pod) and some impressions from the open air museum park. Last Sunday Martin and I had an early morning game of SAGA. Yes you are right… Sundays are for sleeping in and not getting up early to play, but hey. Since I still only have my Vikings to play, Martin went for Normans to give us a change from the old routine. We also went for “The Challenge” to try out another scenario. 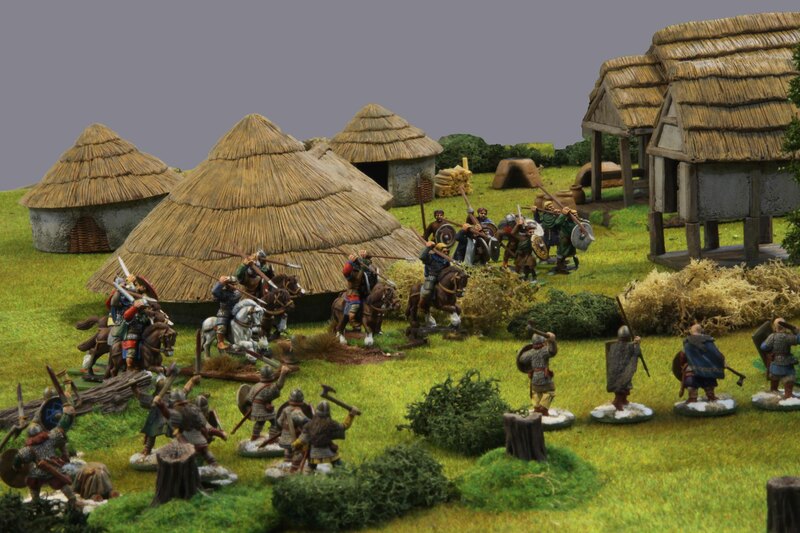 The Normans consisted of a mounted Warlord, three units of mounted knights (Hearthguard), two units of Sergeants (Warriors), one of them armed with crossbows and one unit of bow armed Peasants (Levies). Martin would amalgamate two of his Knight units into a large one. 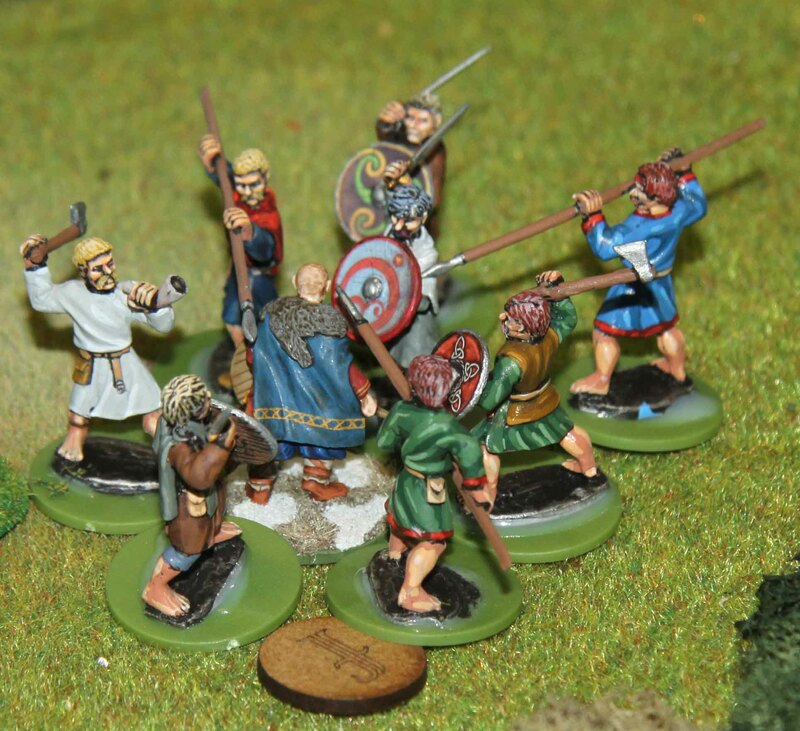 I had my Warlord, Jarl Sigvaldi and his Jomsvikings (Hearthguard / Mercenaries), one unit of Berserkers (Hearthguard), two units of Hirdmen (Hearthguard) and one unit of Bondi (Warriors). Just like last time I would amalgamate both Hirdmen units into one large unit. 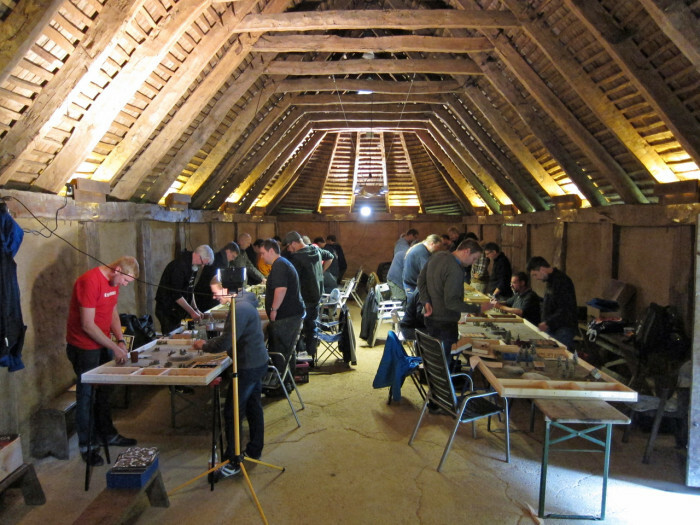 The table featured a Viking village in one corner and a Norman keep in the opposite one. Made me wonder if they had a zoning permit for the keep! Lets see what good it did them! ;-). 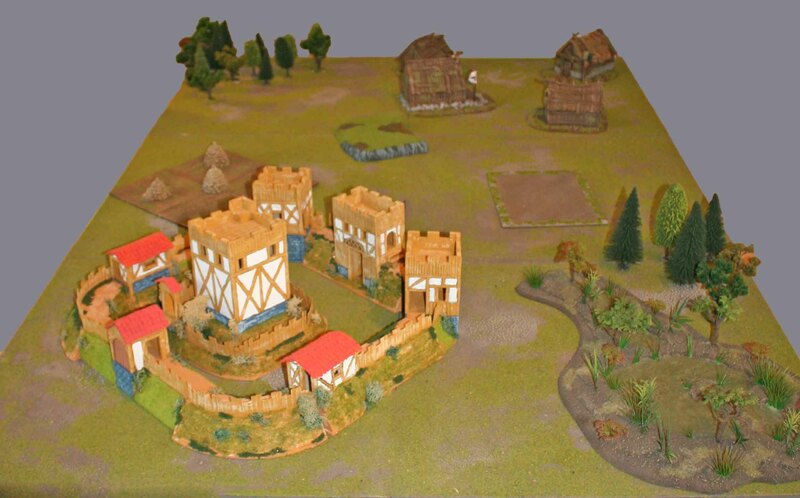 The other corners features some small woods, but the centre of the table was fairly open except for a small hill. Martin won initiative and placed his Warlord in the centre and I placed mine close to his as per set-up rules. Then we alternated placing our units. Seen from my point of view the Norman cavalry was in a long line on the left with the Sergeants behind them. 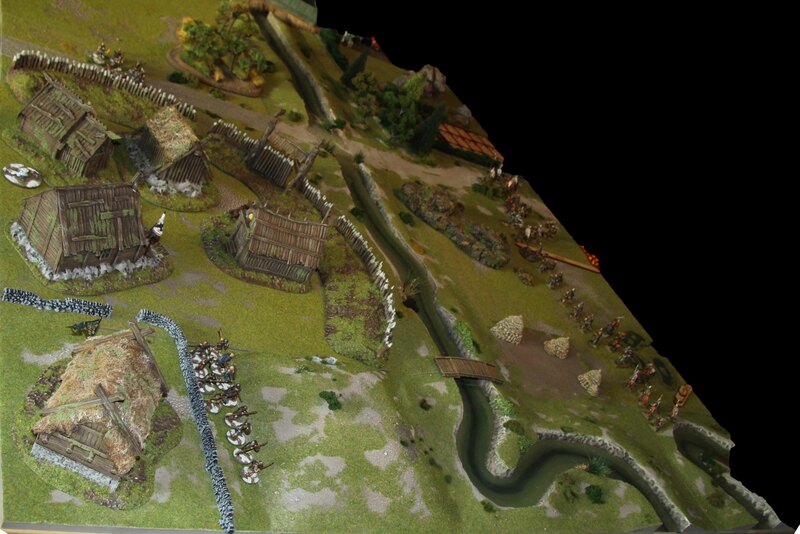 On the right the Levies brought up the front, with the Crossbows behind them. 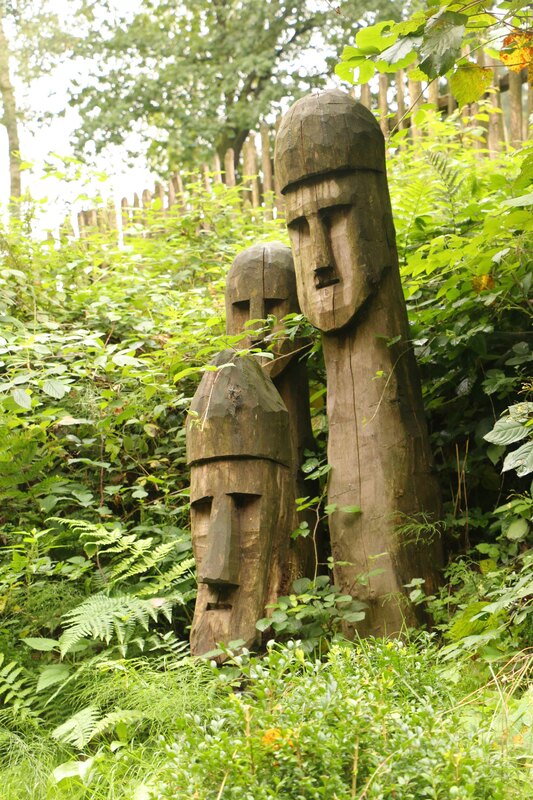 I placed all my Vikings in a long line… left to right the Jomsvikings, Bondi and the Hirdmen. 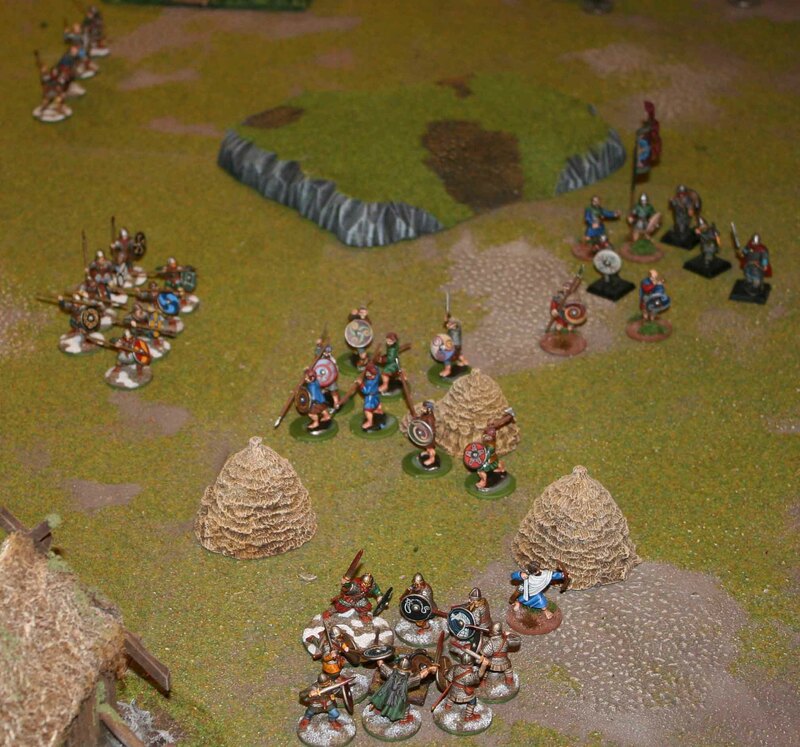 The Berserkers started behind the Hirdmen to keep them safe from all those arrows on that flank. Since I was done setting up first, I got first initiative. At first I contemplated attacking the Norman Warlord right away, but this would have meant that the Norman cavalry would reach him far before the Vikings would be there to support their Warlord. So I just moved my Warlord back towards my line and the Vikings forward. Honestly I was hoping for Martin to come after me, but he did not do me that favour and just moved his line forward as well. On my next activation I moved forward once more and my Warlord moved behind the Heathguard screen. Now the Knights were in range to charge and so the did. The double sized unit made contact with my Hirdmen. Since the SAGA dice gave them extra attacks, I decided to trade half my attacks for four extra defencive dice. In the end only two Vikings died, but they killed four Normans and they had to retreat. Now I was time to follow this up. The Hirdmen pushed after their attackers and killed them all. 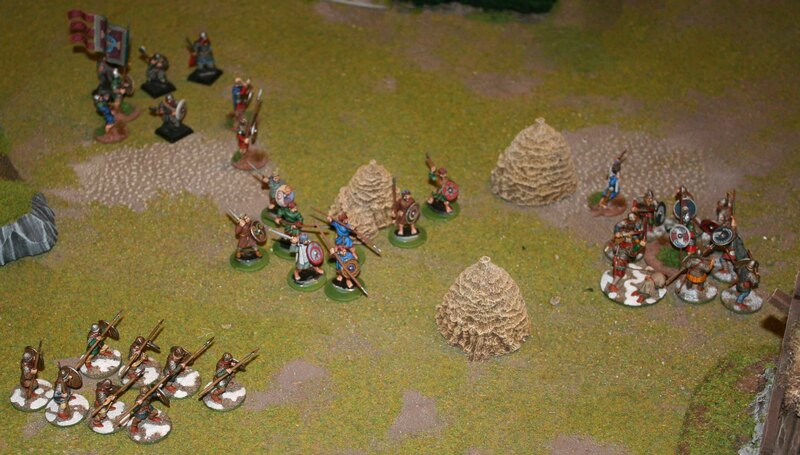 The other units just moved forward, while the Berserkers pushed out to the side and attacked the Levies on the hill. I gave them a few extra attacks, but rolled below average. So only half the Levies died for the price of two Berserkers. 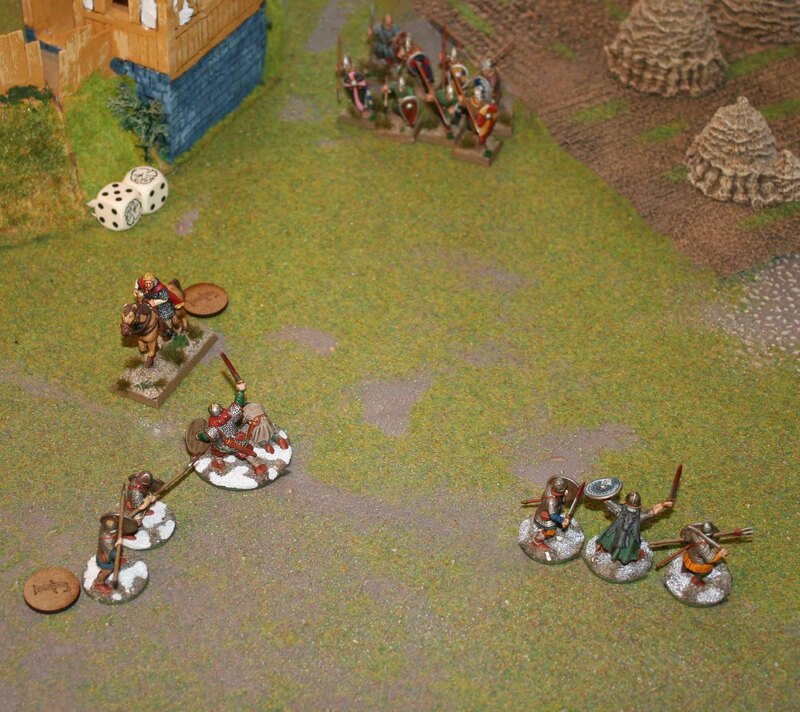 Unfortunately the Levies would now retaliate and annihilate the Berserkers in a hail of arrows. 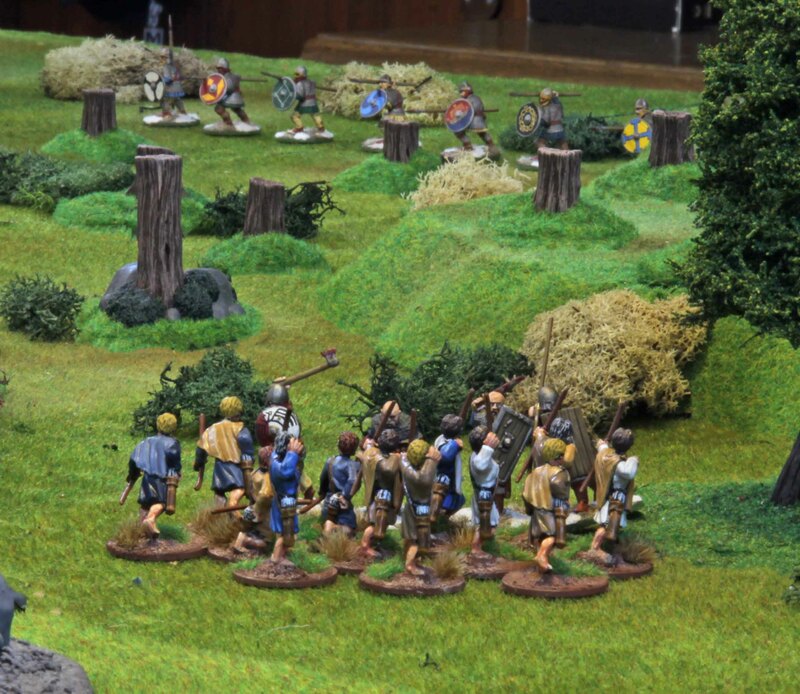 The Crossbows would loosen off against the Hirdmen, but only with limited success. But now things got interesting. I had rolled low when I rolled for the Jomsviking abilities that round. So when I moved them forward I was hoping for Martin to go for them, since they are usually his Nemesis. And he did charge them with the small unit of Knights accompanied by his Warlord. 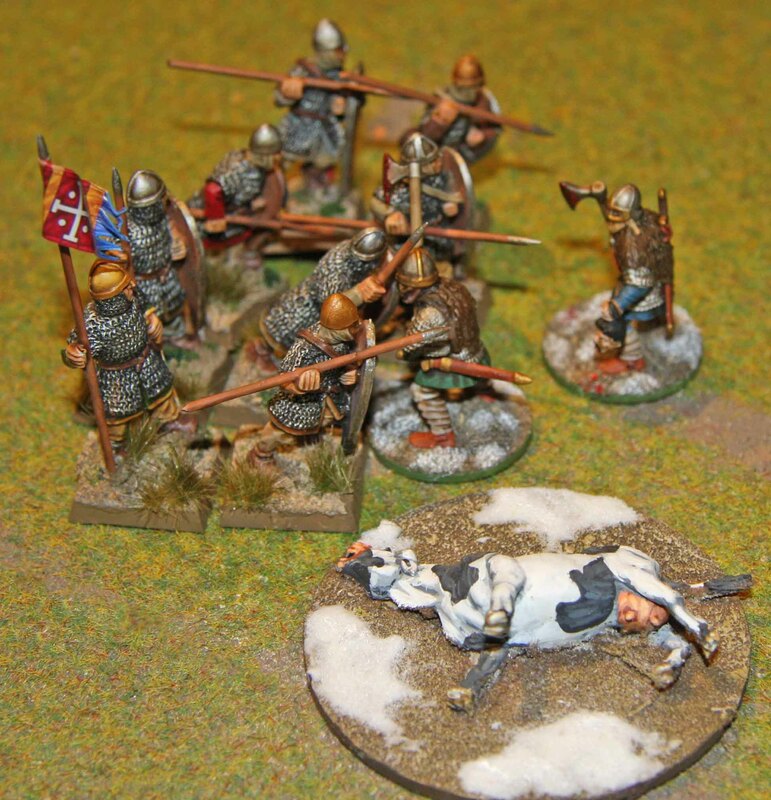 Two of the knights were killed, the Warlord got one wound (in this scenario he has twelve wounds instead of two), but the Jomsvikings were wiped out. A bad result? Not really. While my Bondi are my weakest unit they were right besides the Jomsvikings. They made use of the Valhalla special ability and traded three of their own for twelve extra attacks, enough to give the Warlord seven wounds. Were the Bondi contend? No. Now they stuck in for another round of combat and the Warlord had to trade the life of the two knights to get away with just one wound. Only two of the Bondi remained, but the Warlord was in a bad shape. Unfortunately my Warlord did not manage to make contact. 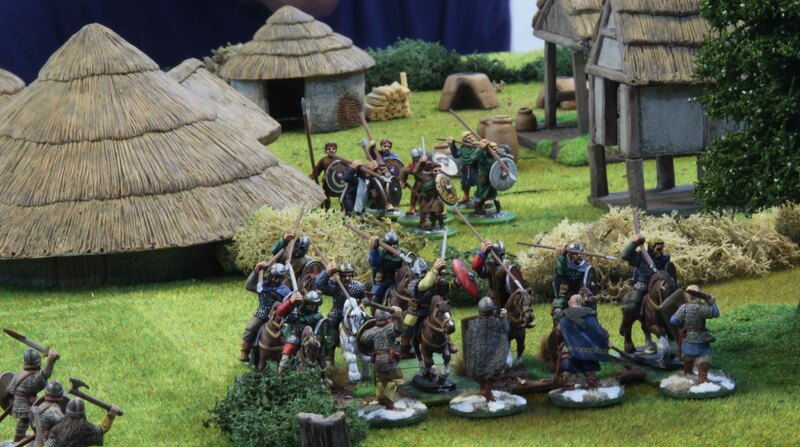 The Norman Warlord decided to retreat towards his Sergeants to get some protection, but due to a bad roll of the SAGA dice this was about all Martin could do. So on my next activation I activated my Warlord twice to catch up with his Norman counterpart ignoring the Sergeants, which he did. The resulting combat was one-sided. The Normans Warlord got five wounds which was quiet an overkill while the Viking Warlord got no wound. So things ended with another Viking win. Martin played Normans. 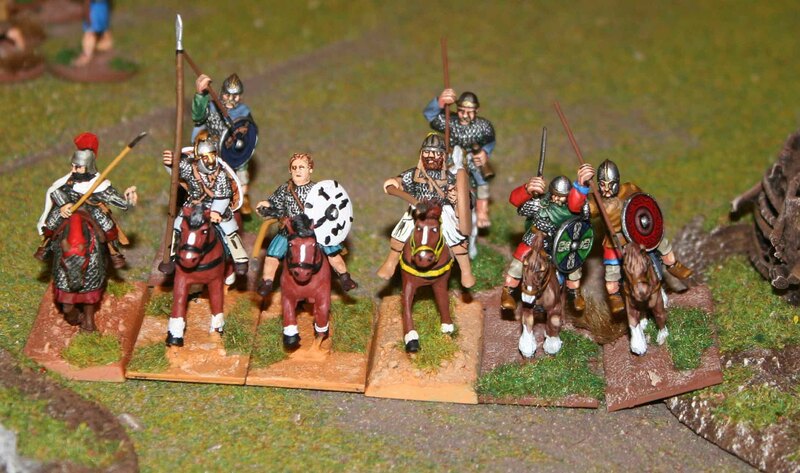 A mounted Warlord, three units of mounted knights (Hearthguard), two units of Sergeants (Warriors), one of them armed with crossbows and one unit of bow armed Peasants (Levies). Again Martin would divide his Peasants into two units. 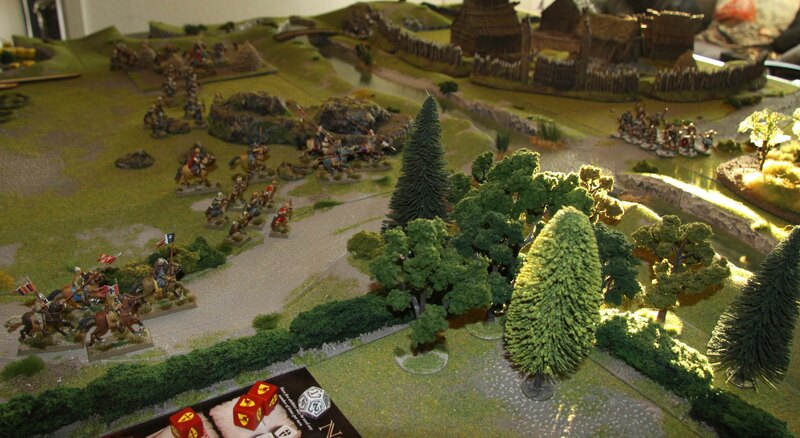 We played the #Battle at the ford” scenario. So we both had to have as many minis as possible on the opponents side of the river that cut the table in half by the end of the game (=end of turn seven). Seen from the Viking side the table looked like this. On my right corner there was a Viking village with five houses, all behind a palisade and a slight hill. There were a large hill in the left corner and a small wood near the ford. As I said, the table was cut in half by a small river. 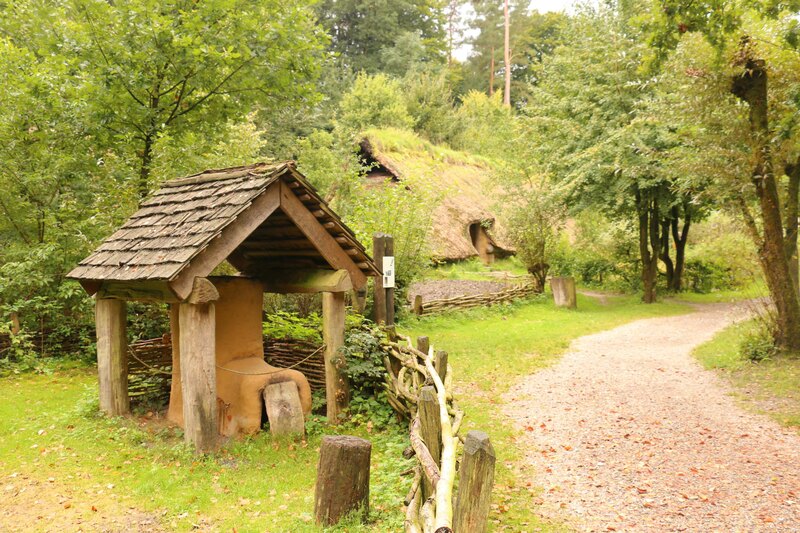 It was impassable except for the ford in the middle of the table and a small bridge in front of the Viking village. There was a larger wood and some hedges on the left, a small hill in the middle and a field to the right, all on the far side of the river. I deployed my Jomsviking mercenaries and Bondi on my right ready to take the bridge. 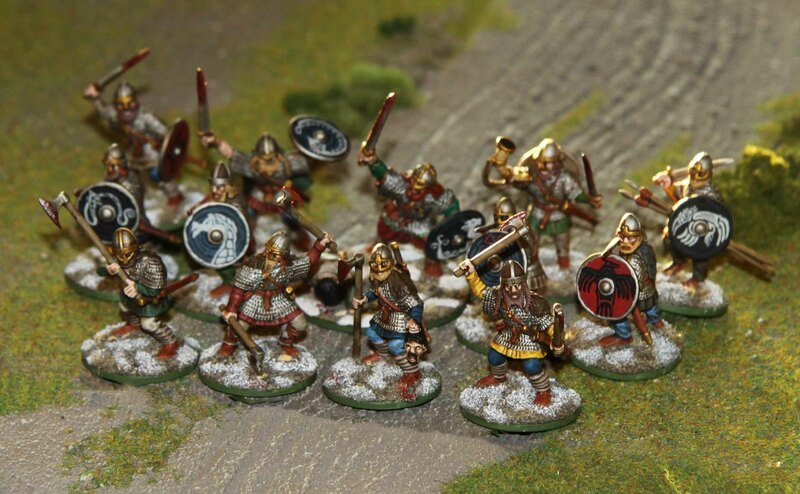 On the road leading up to the ford were my Berserkers, Warlord and large unit of Hirdmen. Since three of Martins units and his Warlord were mounted, I expected them to make a rush for the ford,trying to get to the other side before I could seal it off. So I deployed my Jomsvikings and Berserkers to the front of their clusters, being the most capable on the offensive. Martins Normans formed a long line. 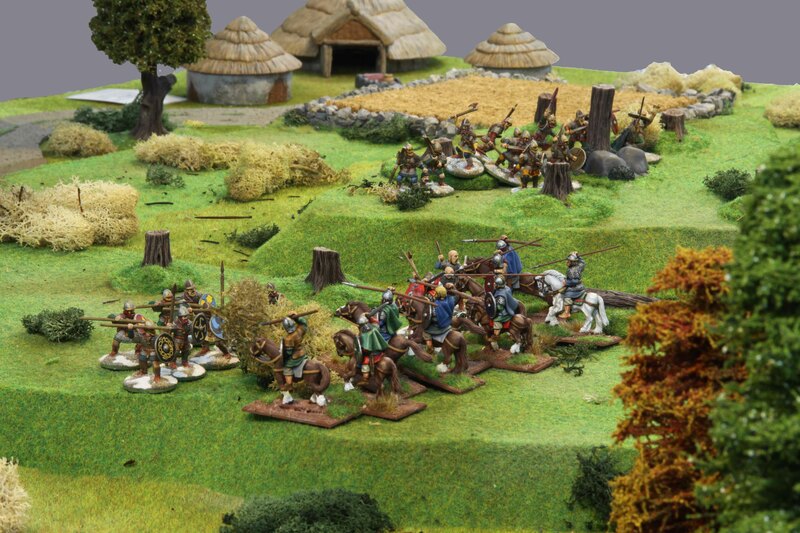 From (his) left to right there were the Sergeants, a unit of mounted Knights, the Sergeants with crossbows, his bow armed Peasants, two more units of mounted Knights with his Warlord and the other unit of bow armed Peasants. I won initiative and the first two rounds were spend moving our units forward. On the third round my Vikings advanced further still, but did not reach either the ford or bridge. But they were now in range of the Normand archers and crossbows. 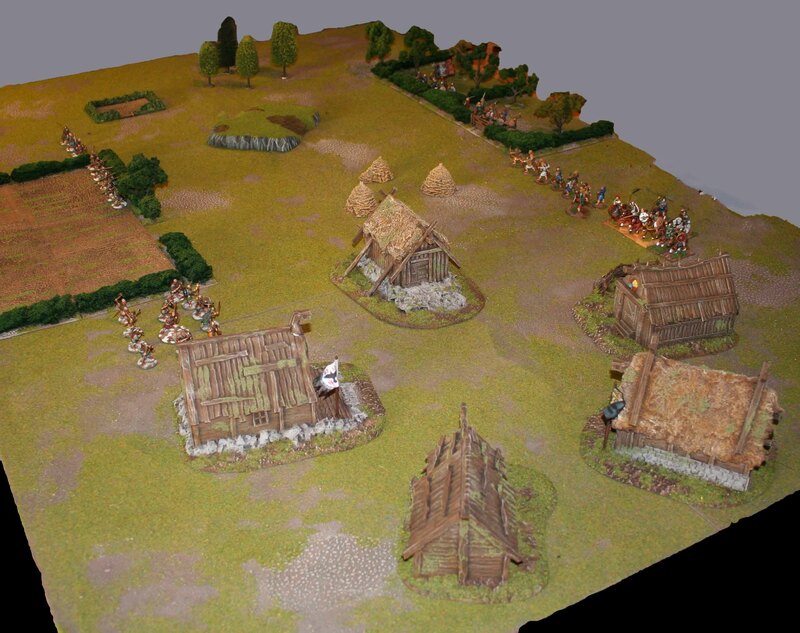 At the ford the Berserkers became the target of the Peasant archers, one of them being struck down. On the other flanks the crossbows wanted to fire at the Jomsvikings, but the gods prevented that (I love the Loki ability). They were activated once more earning them a fatigue marker and were able to fire this time, killing one of the Jomsvikings. 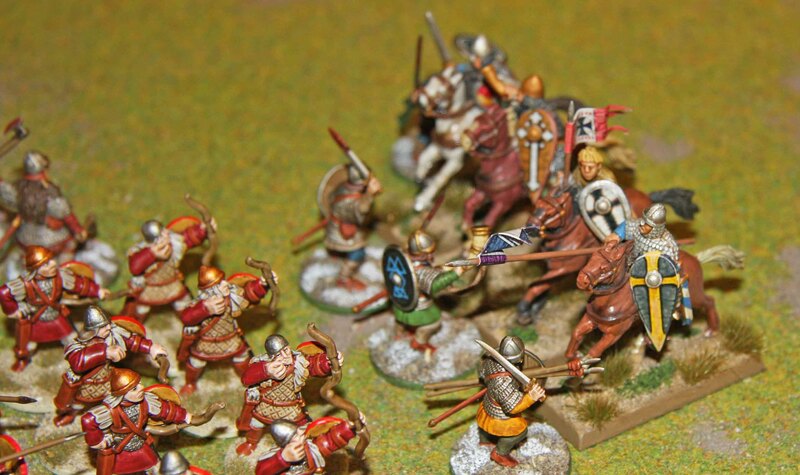 But the knights made no real moves towards the crossings. At the beginning of the next round the Normans were still out of reach for me, but I was able to move my units onto the bridge and into the ford, effectively sealing both off. Things did not look like I would be charged at the ford and the Normans seemed contend to just fire arrows at me over there. So the Hirdsmen and Warlord overtook the Berserkers. With their heavier armour they would be able to weather the storm of arrows far better. Which they did not loosing a single fighter to missiles till the end of the game. 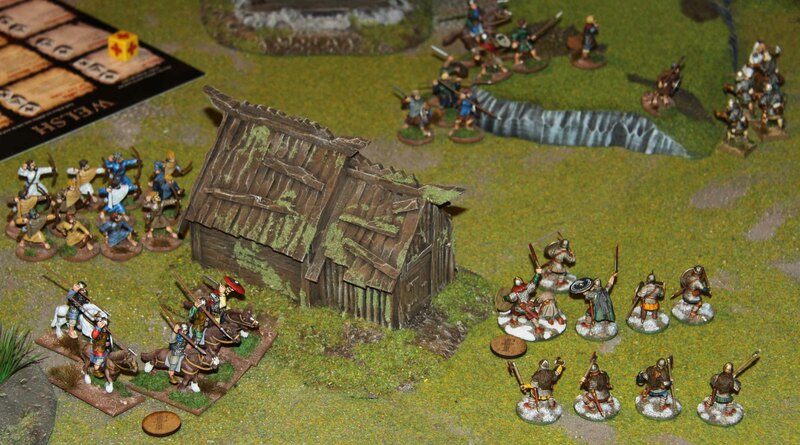 The other flank saw more crossbow fire on my Jomsvikings. They were already fired up on their abilities in preparation of the fight to come and suffered no more losses. But then the were charged by the Norman knights. 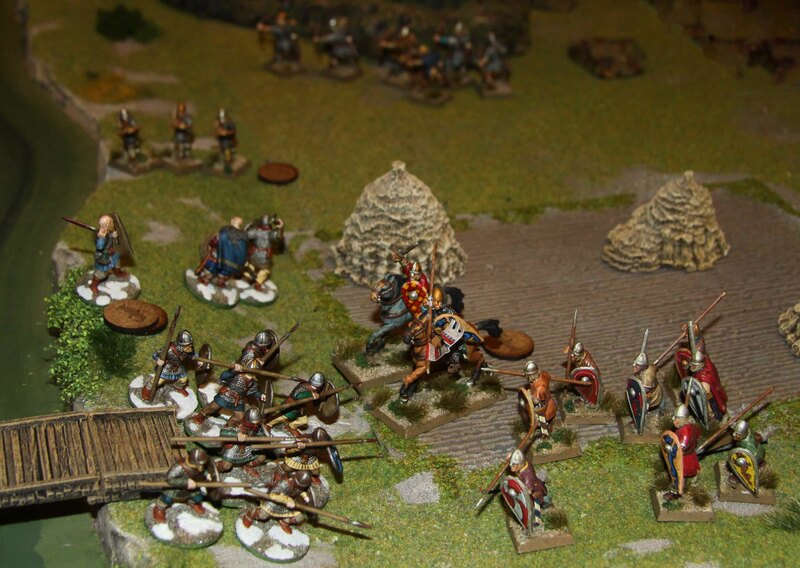 The fight was ferocious with the Normans getting help from the dice on the battleboard. But it was to no avail. 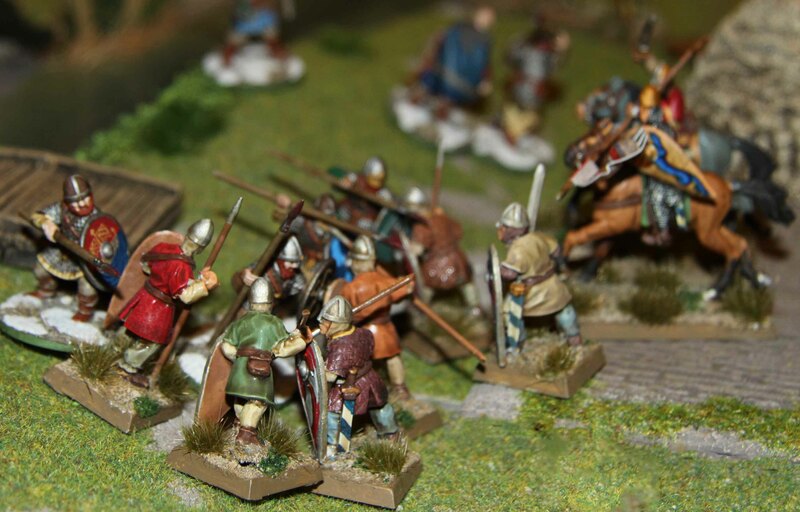 Two knights died and the Jomsvikings just stood there on the bridge, not suffering any losses. 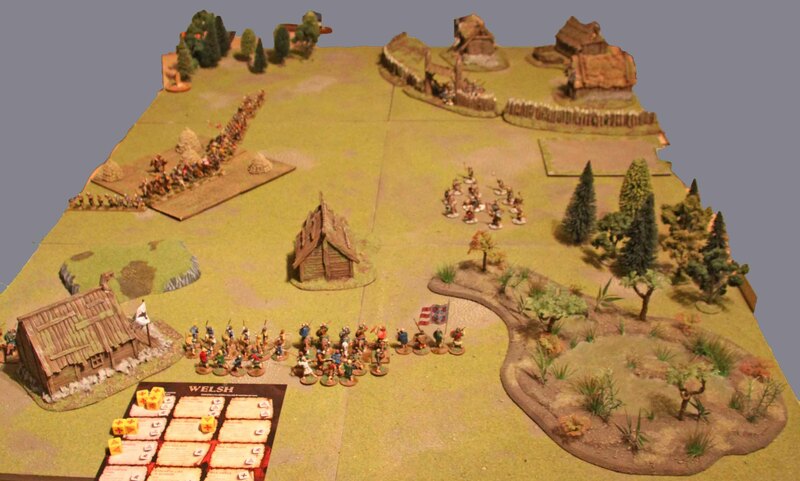 Since the Normans at the ford were still too far out for an effective charge and I did not want to blow my units on some lowly Levies, I decided to sit it out at the ford and assigned most of my SAGA dice to the units at the bridge, only reserving some to make them stronger vs. missile attacks. So almost everything went into the other flank. 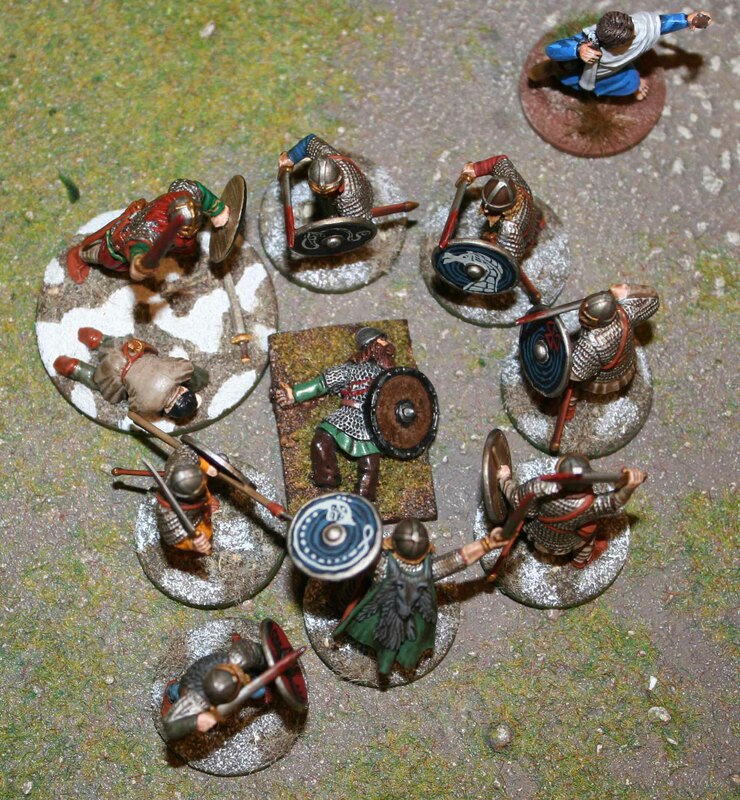 My Jomsvikings charged the crossbows, killing 5 Sergeants at no loss of their own. Bondi were too far out for an attack and only moved to the far side of the bridge to seal it off. The Bondi were then charged by the Sergeants. I suffered two killed and my Bondi were driven back onto the bridge. The knights took no part in the fighting there. The crossbows tried their luck on the Jomsvikings again, but were too few and even making use of my two fatigue counters killed none of my Mercenaries. By the ford the Norman Warlord was still happy just firing at my Vikings, but with a little help of Asgard, failed to make an impression. Some of the Norman knights even drew back. 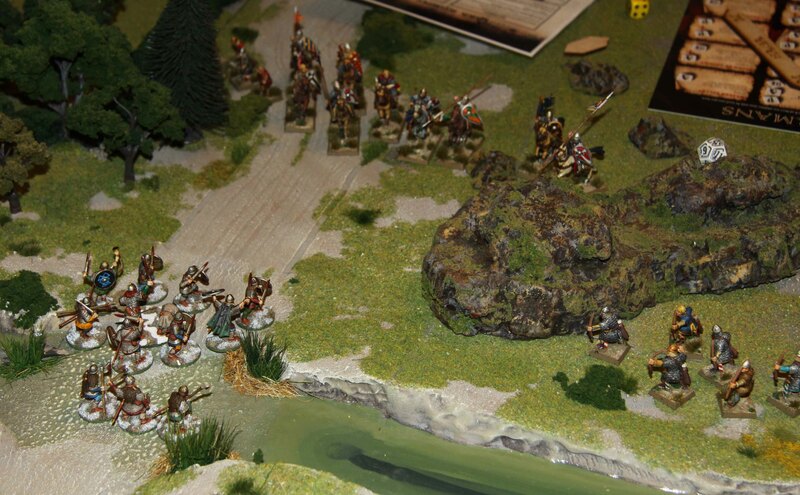 Since the Normans had even pulled back by the Ford I now concentrated all my efforts (and SAGA dice) on the bridge. Now it was time for payback, Bondi style. They charged the Sergeants and locked them in two rounds of combat, killing three of them at the loss of only one and driving them back. 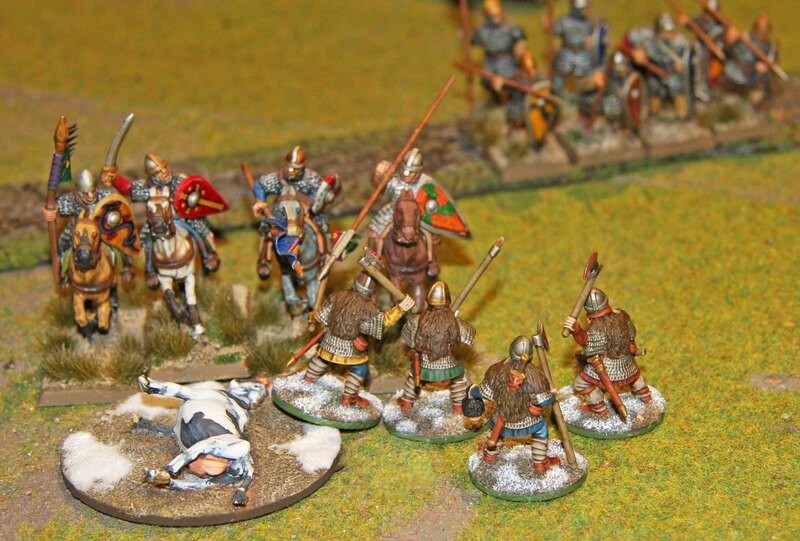 The Jomsvikings turned away from the Crossbows and charged the remaining two Knights killing them at no loss. 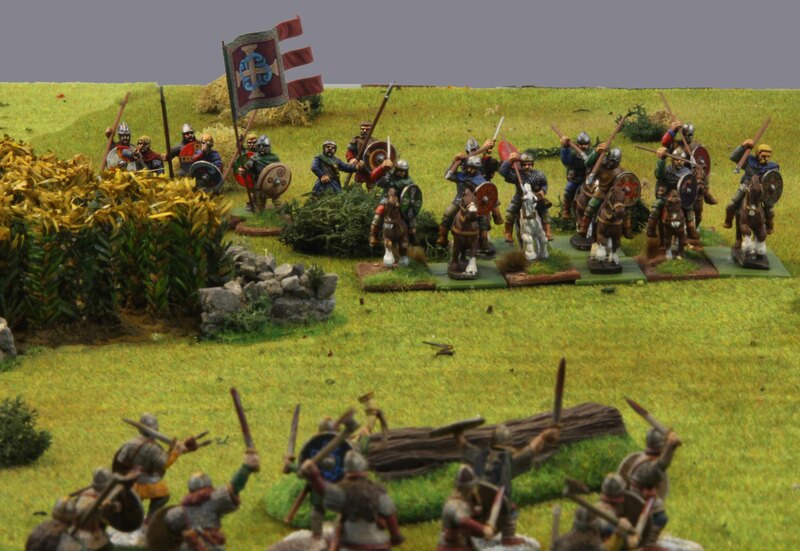 Now the Normans finally began to move into position for an attack at the ford. And charge they did. 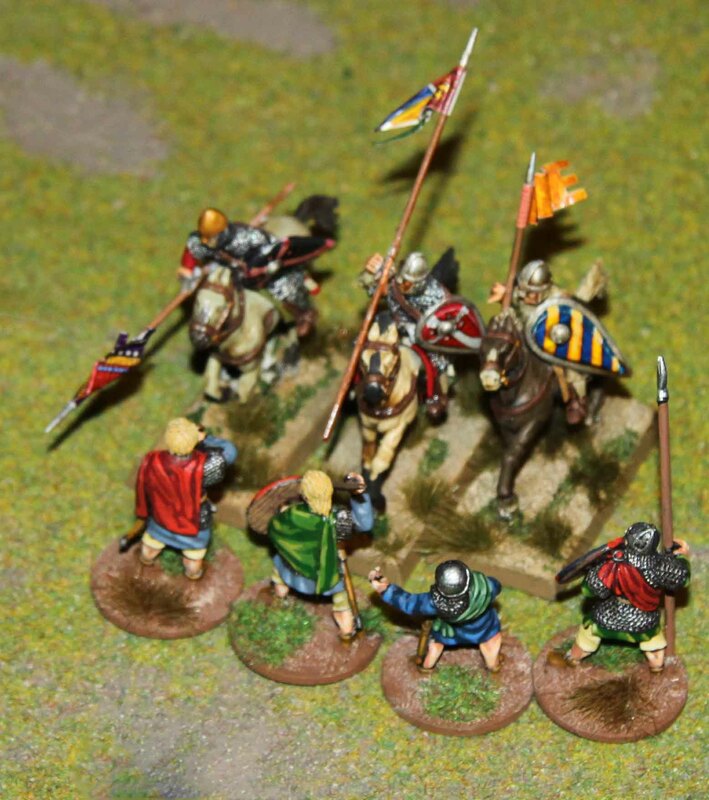 First came the Norman Warlord accompanied by a unit of knights. Both sides made use of SAGA dice and in the end three Vikings died in the charge, but so did all four Knights, forcing the Warlord to withdraw. Forward charged another unit of Knights. All splendid in their shiny chainmail, with banners flapping. But only one of them was able to leave alive and they had only killed two more Hirdmen. 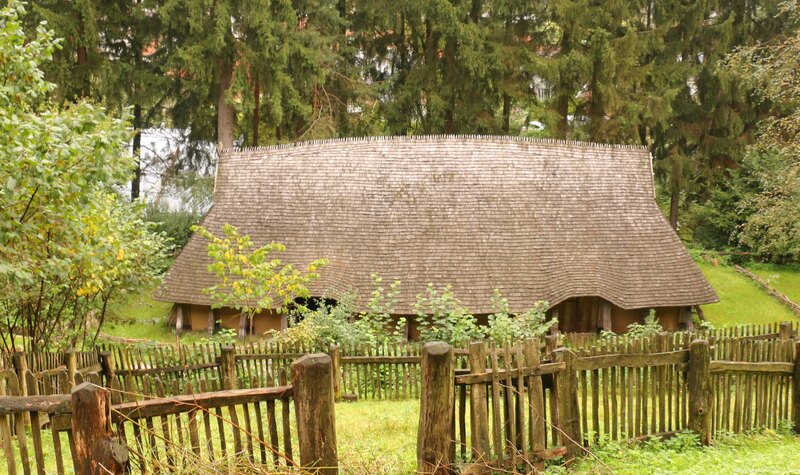 The Norman force at the ford was spend. Only the Warlord, a Knight and two six-men units of Peasant archer remained. 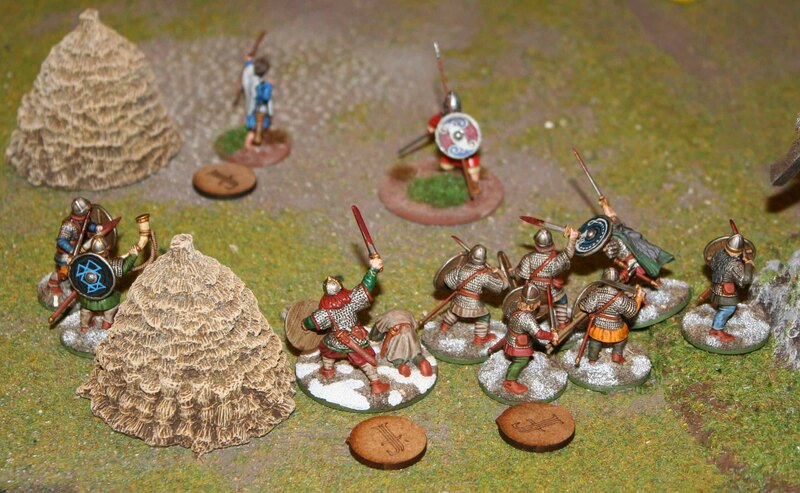 No match for a Viking Warlord, three Hirdmen and three Berserkers. On the other flank the there was some preparatory fire from the crossbows on the Jomsvikings, but again they failed to make an impression. 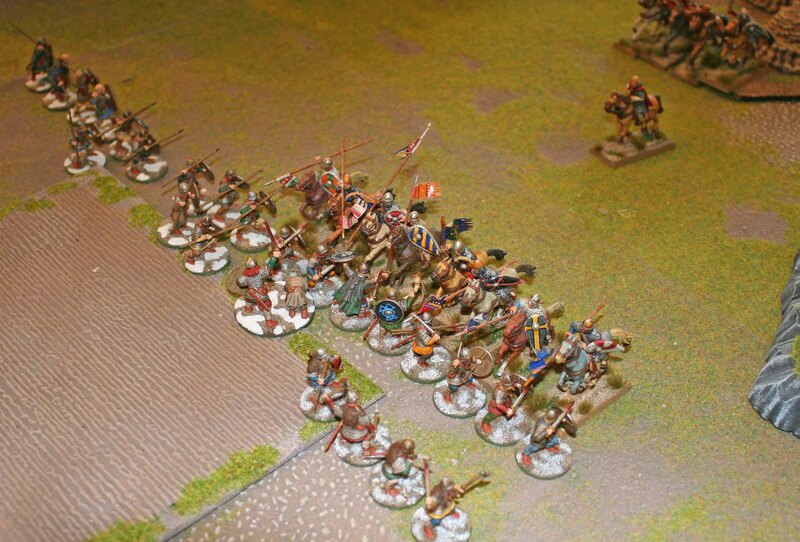 Then the Sergeants charged the mercenaries, but only suffered losses and no gains. So by the bridge it was only three crossbows and three Sergeants versus three Bondi and three Jomsvikings. So they too had little hope of driving the Vikings back, much less making it to the other side. With all the Vikings on the Norman side of the river and a force too spend to drive them back, the Normans called it a day early and withdrew. All in all it was a good game. This time the Jomsvikings did not fail me, but they did so in a scary way. The worst I ever rolled when it came to their abilities was a nine, so they were always high on abilities. All in all they might even have been able to hold the right flank on their own. They were so powerful, that they distorted the game to a certain degree. The next one or two battles will show if they are so much of a force that they distort the game. If they are, I think I will only use them as normal Vikings to keep the game fun!